(Nanowerk News) Tiny particles in air pollution have been associated with cardiovascular disease, which can lead to premature death. But how particles inhaled into the lungs can affect blood vessels and the heart has remained a mystery. 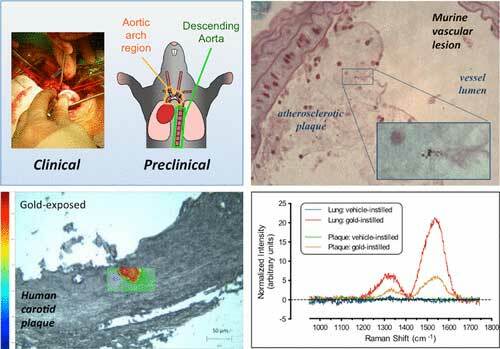 Now, scientists have found evidence in human and animal studies that inhaled nanoparticles can travel from the lungs into the bloodstream, potentially explaining the link between air pollution and cardiovascular disease. Their results appear in the journal ACS Nano ("Inhaled Nanoparticles Accumulate at Sites of Vascular Disease"). The World Health Organization estimates that in 2012, about 72 percent of premature deaths related to outdoor air pollution were due to ischemic heart disease and strokes. Pulmonary disease, respiratory infections and lung cancer were linked to the other 28 percent. Many scientists have suspected that fine particles travel from the lungs into the bloodstream, but evidence supporting this assumption in humans has been challenging to collect. So Mark Miller and colleagues at the University of Edinburgh in the United Kingdom and the National Institute for Public Health and the Environment in the Netherlands used a selection of specialized techniques to track the fate of inhaled gold nanoparticles. In the new study, 14 healthy volunteers, 12 surgical patients and several mouse models inhaled gold nanoparticles, which have been safely used in medical imaging and drug delivery. Soon after exposure, the nanoparticles were detected in blood and urine. Importantly, the nanoparticles appeared to preferentially accumulate at inflamed vascular sites, including carotid plaques in patients at risk of a stroke. The findings suggest that nanoparticles can travel from the lungs into the bloodstream and reach susceptible areas of the cardiovascular system where they could possibly increase the likelihood of a heart attack or stroke, the researchers say.